Lecce, Italy, sometimes called the Florence of the South, is the main city on southern Puglia's Salento Peninsula and one of the top places to go in Puglia. Because of the soft limestone that's easy to work, Lecce became the center for the ornate architecture called the Barocco Leccese and the city is filled with Baroque monuments. The historic center of Lecce is compact, making it a great place for walking and its restaurants offer abundant fine food typical of Puglia. Also notable are traditional handicrafts, especially the art of paper mache'. Piazza del Duomo, or Cathedral Square, is a beautiful square with ornate buildings. Here you'll find the Duomo di Maria Santissima Assunta or the Cathedral of Our Lady of Assumption, originally built in 1144 and completely restored in 1659-70 when the 70-meter tall bell tower was added. The Bishop's Palace and Seminary, two Baroque monuments, are also in the square. Via Vittorio Emanuele is the main street lined with shops and cafes that runs between Piazza del Duomo and Piazza Sant'Oronzo. Along the street, you'll find the tourist information office and Church of San Giovanni Battista. The Roman Amphitheater was built in the second century AD and once held 25,000 spectators. The amphitheater is partially excavated but monuments have been built above most of it. You'll see the remains near Sant'Oronzo Square where there's a Roman column topped by a copper statue of Saint Oronzo, the city's patron saint. Church of Santa Chiara, famous for its ceiling with paper mache' decorations, is a short distance from the amphitheater. Archaeological Museum, open only on weekday mornings, and remains of a Roman theater, discovered in 1929, that once held 6000 spectators are behind Santa Chiara. Basilica of Santa Croce, on Via Umberto I, has a richly decorated facade and is considered the emblem of the city. Next to the church is Palazzo Celestini, a former monastery that's now a government building. Behind it are the municipal gardens. Castle of Charles V was built in the 16th century and was the royal residence. Next to it is the Opera House. Provincial Museum, on Viale Gallipoli, houses important finds from the city and the region. A few kilometers south of Lecce is Grecia Salentina, a group of towns with nice historic centers where a Greek dialect is still used. Some of these towns can be reached by train. Though Lecce is some distance inland from the coast, this sunny corner of Italy makes one yearn for a nice sandy beach in the summertime. The closest beach is at San Cataldo, about 20 minutes due east of Lecce. Nicer still are the beaches at Frigole and Spiaggiabella, just a little farther north on the coastline. Like most beaches in Italy, they offer a mix of stabilmenti, or beach establishments with lounge chairs and umbrellas to rent, as well as free access areas where you need to bring your own beach umbrellas and chairs. Lecce is on the Salento Peninsula, the heel of the boot, in southern Italy's Puglia region. The climate is fairly mild although it can get very hot in summer and colder than you might expect in winter - see Lecce Weather and Climate for average monthly temperatures and rainfall. Lecce is the terminus of the rail line that runs along Italy's east coast. 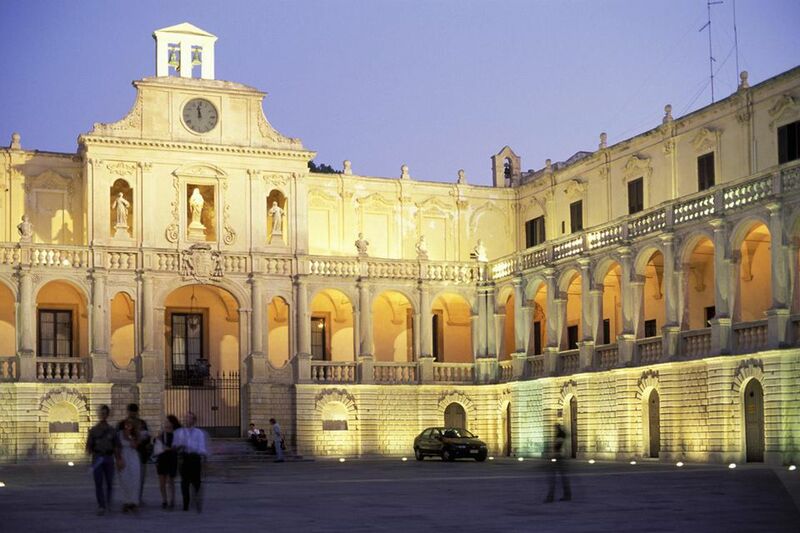 A direct Frecciargento train from Rome reaches Lecce in 5 hours and 20 minutes. It's half an hour to 40 minutes from Brindisi. The Ferrovie Sud Est serves small towns on the peninsula and has a station in Lecce so you can reach many places in the area by train. (see Puglia train times map) From the train station, it's a short walk to the historic center. The closest airports are in Brindisi and Bari.